Dental implants are the best choice to replace missing or failing teeth. Dentures can slip and pinch, while dental implants are anchored securely to the jawbone. With dental implants, you can eat, speak, and laugh with confidence, and you will avoid the progressive jawbone loss that is a hallmark of denture wearers. Yet there are many different dental implant options, which could leave you at a loss as to which to choose. Here is what you need to know. Partial dentures or traditional bridges were once the only options to replace a single missing tooth. Partial dentures are often uncomfortable, and the metal clasps are easy to see. Traditional bridges require us to remove healthy tooth structure from the anchoring teeth, increasing the risk for decay or fracture. A single tooth dental implant uses a single biocompatible titanium implant to support a highly natural custom crown. If you are missing two or more teeth in a row, an implant supported bridge may be the best option. 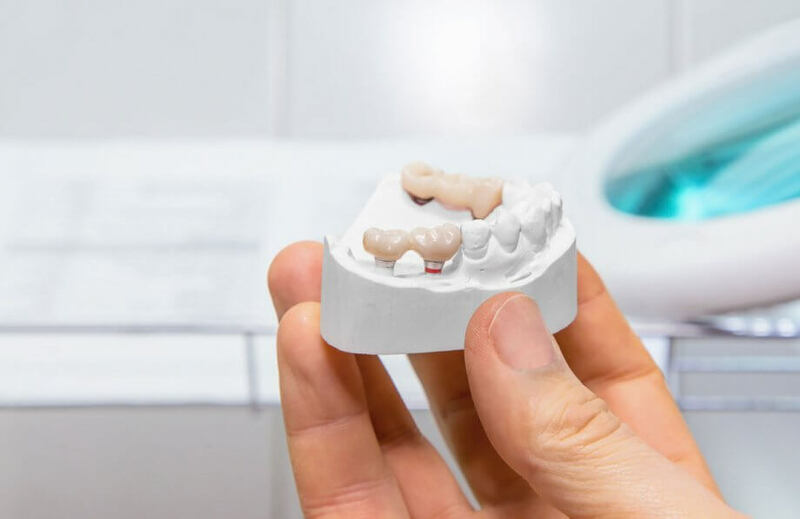 Secured on a dental implant at each end, this type of bridge is highly aesthetic and functional, and it preserves the healthy structure of the neighboring teeth. Traditional dentures are supported by the gums (lower) or a hefty plastic palate (upper), and they can cause mouth sores and trouble chewing. Implant supported dentures allow us to reduce or remove the palate of an upper denture, and to stabilize a shifting lower denture. The implants also restore nearly all of your bite strength, allowing you to eat steak and corn on the cob with ease. If you want to remove your dentures for oral hygiene or sleeping, we can create a “snap on” denture with just three dental implants. It will lock securely in place, but it will be easy to remove. If you prefer that your teeth never leave your mouth, a handful of strategically placed dental implants can support a full bridge of fixed, highly aesthetic replacement teeth. Traditional dental implants need several weeks or months to fuse with the jawbone before they can take the stresses of biting and chewing. You will need to wear a temporary denture during this time. Immediate load implants allow you to avoid the denture altogether. Lightweight but highly functional and aesthetic replacement teeth are placed on the same day as the implants. You will then return in a few weeks or months for your final teeth. Although the interim teeth are not *quite* as perfect as the final teeth, they are light years better than a temporary denture. There are many options to restore missing teeth. We will carefully examine your oral tissues and discuss your goals and desires, along with your budget. We will then create an individualized treatment plan to help you achieve the smile of your dreams.